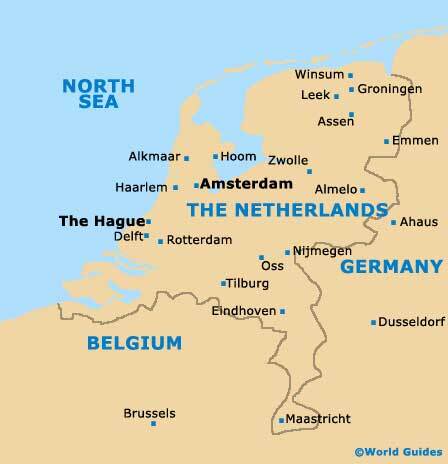 The country of The Netherlands is situated in Western Europe, on the North Sea. Most of The Netherlands is low and flat, with part of the country being below sea level, and this is where the famous Dutch dykes are in use. Amsterdam is capital city of The Netherlands and The Hague is the seat of government. There is a wealth of accommodation in The Netherlands to suit all travellers including budget lodging, travel lodges, bed and breakfast and luxury hotels. Places to visit in The Netherlands are endless and there is something to suit everyone with sporting venues, walking trails, museums, landmarks, monuments, festivals, carnivals, and quality shopping. The Netherlands has a long and rich heritage and there are numerous places of interest to visit that include Rotterdam, Alkmaar, The Hague, Edam, Gouda, Delft, Haarlem and Amsterdam - one of Europe's most popular cities featuring a wealth of attractions including historic sites, mumeums, art galleries, entertainment, pubs, nightlife and of course canals. Amsterdam is one of Europe's most popular destinations and offers a diverse selection of attractions, ranging from heritage sites through to the house where Anne Frank hid during World War II, and also the infamous red light district. Eindhoven is a vast and spreading city, boasting many unusual qualities. The city has become well-known for its football team, the PSV, who regularly dominate the National League and are often watched by crowds of around 30,000 spectators. Situated on the southerly side of the Netherlands, Maastricht is especially close to the Belgian and German borders. Maastricht is a historic Dutch city and its pan-European character is reflected around its cultural heart of Vrijthof Square. The second-biggest city in the Netherlands after Amsterdam, Rotterdam boasts a truly unique appearance, since many of its buildings are fairly modern, being rebuilt after WWII. Rotterdam has been transformed with many stylish structures. The Hague is Holland's third-largest city and is perhaps best known to the Dutch as either Den Haag or alternatively 's-Gravenhage. Once the capital of the Netherlands, The Hague is home to the popular seaside resort of Scheveningen.